Austin City Limits, or as some say, Austin City ‘No’ Limits. Back-to-back weekends of dressing in head-to-toe Free People, floral crowns, and Flash tattoos, pretending like that’s what you wear everyday. I channeled my inner hippie festival girl last weekend, but the second weekend of Austin City Limits is about to begin. Most people go for the music, which I did, but I also secretly went for the food. With the help of my friends, we tried our best to test out all the eats. From my eating research last weekend, I now bring all you 2nd weekenders a roadmap to a happy tummy. 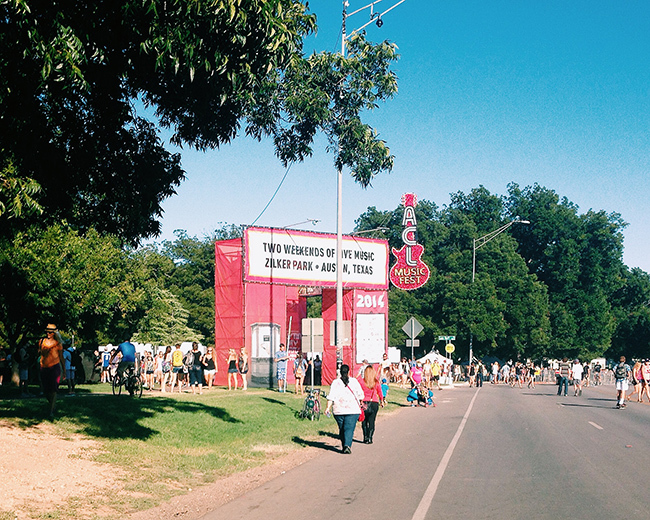 ACL prides itself on not selling things you would find at a normal fair or festival. No turkey legs, just authentic local Austin food. 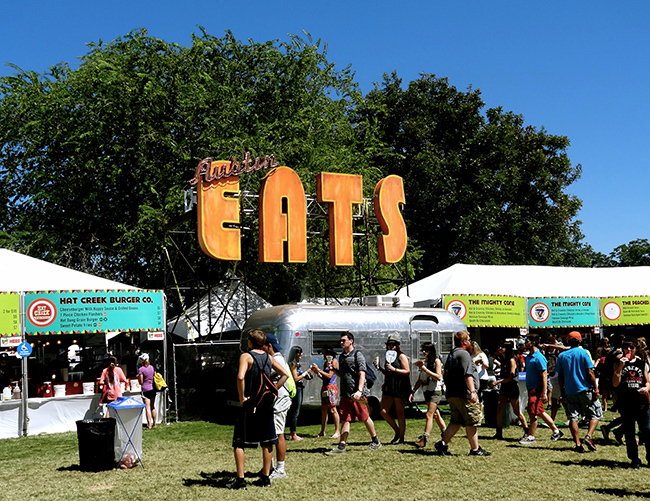 Austin Eats offers a variety of health conscious, vegan, gluten-free, but also super creative food. 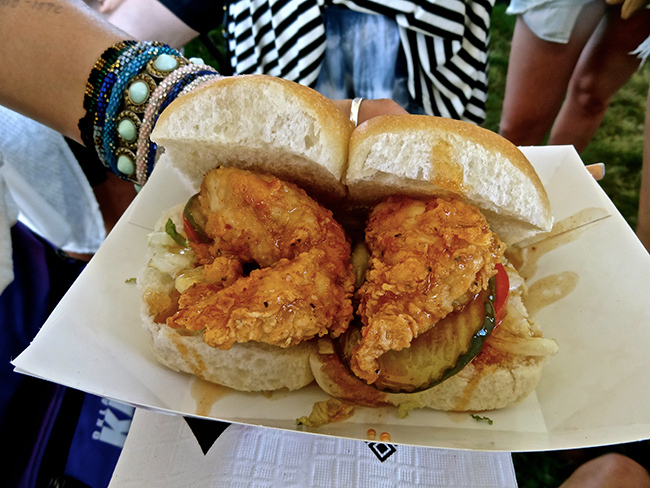 Next, make a stop at Max’s Wine Dive and order the fried chicken sliders. Seriously amazing. 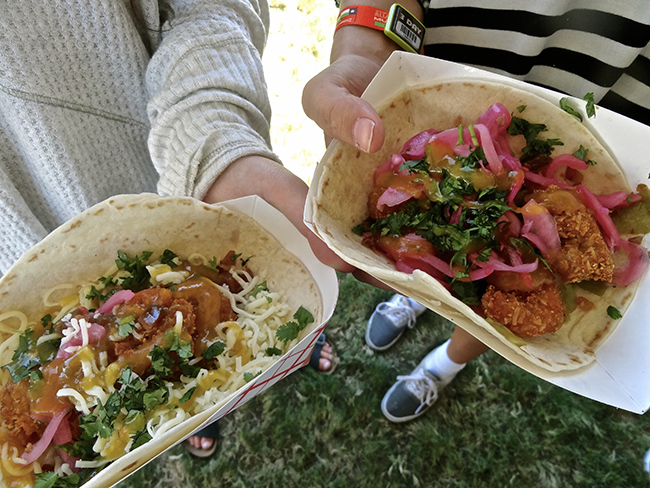 Then you have to hit up the Scallywag Taco from Torchy’s Tacos: coconut battered shrimp taco with bacon, green chilies, pickled red onions and habanero peach jam. Then we discovered the pork buns from East Side King. I had never had a pork bun before and this seemed like the perfect time to finally test them out. 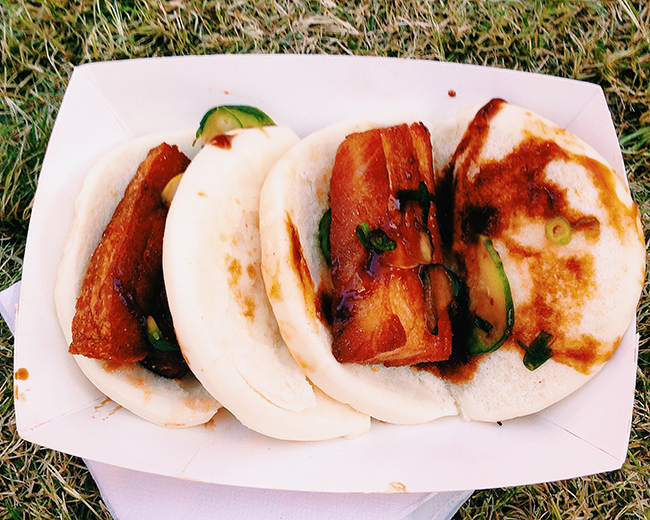 The soft pillowy bun is filled with a big piece of crispy pork belly, scallions and pickles. It was pig fat deliciousness. Between the frequent visits to the food stands, too many Miller-Lites, and standing in the sun all day, I got a little sleepy I entered a serious food, drink and sun coma. 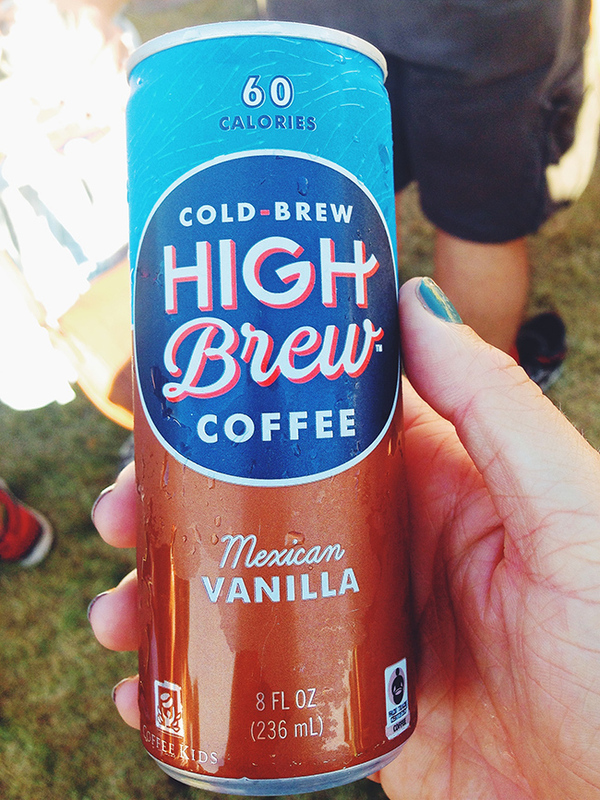 Thankfully I discovered the godsend that is Mexican vanilla iced coffee from High Brew Coffee for a mid-day jolt. They serve these at all drink stands. I was able to spend sometime outside the festival to take a bite from some brick-and-mortar Austin restaurants. Taco Deli fueled me with breakfast tacos for Day two of the festival. 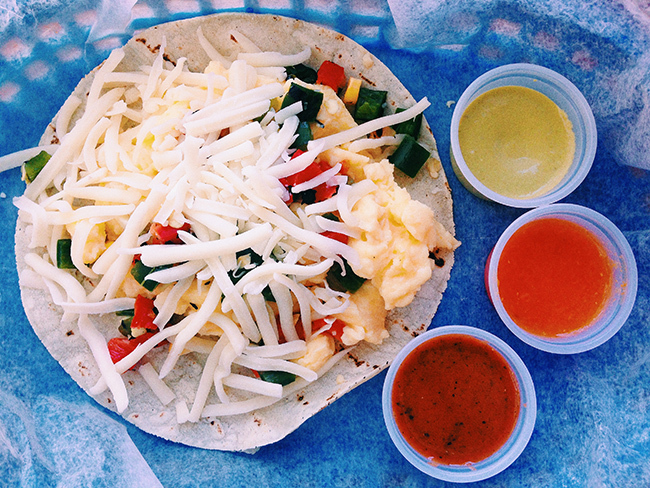 Try The Vaquero taco: scrambled eggs, grilled corn, roasted peppers, jack cheese and a variety of salsas for dipping. Classic Austin. Texas French Bread was Day three’s fuel, which is located on West Campus near all you Texas Spooners. 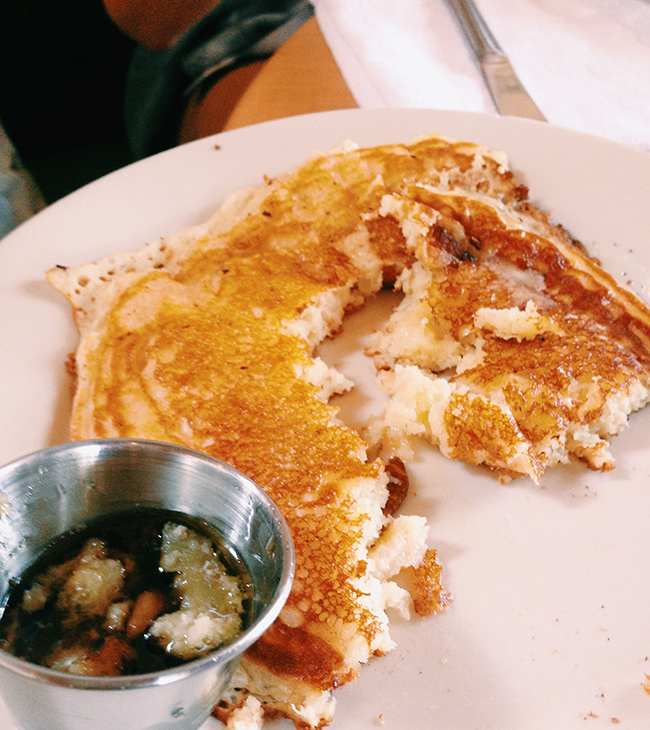 We were told “you have to get the pancake!” And it’s true, we had to get the pancake. So if you’re ACLing this weekend you now have your foodie guide. Eat, drink and enjoy Sam Smith, Lorde, Eminem and Iggy for me. 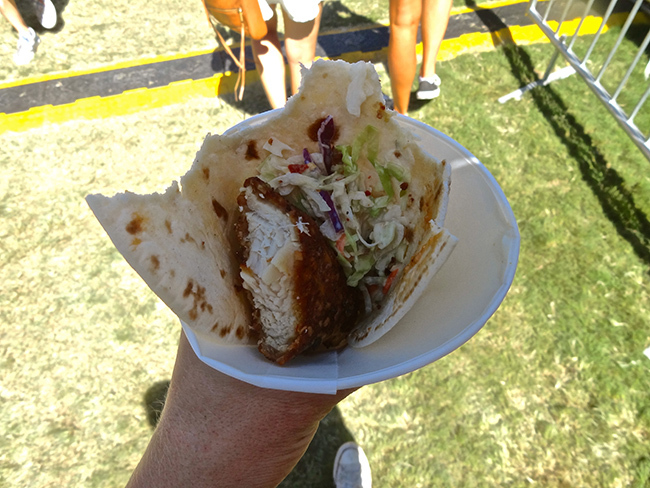 Be sure to check out Texas Spoon’s recap of 7 foods you have to try at ACL. A version of this post was originally published on Annie’s Take a Bite blog.